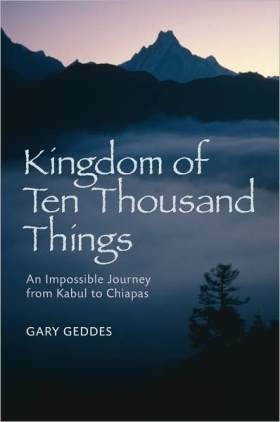 Kingdom of Ten Thousand Things: An Impossible Journey from Kabul to Chiapas by Gary Geddes was the last of three books I read over the Christmas break. I went on a read ing binge over the break in an attempt to clear off my “to do” bookshelf a bit. And this one had been sitting on the shelf for a while; I’ve had it for so long that I don’t even remember where I picked it up, possibly having received it from the publisher. Geddes writes about his own journey retracing the footsteps of Buddhist monk Huishen. He read about Huishen’s journey from Kabul to Mexico, and was interested in taking the same route and finding proof that the Chinese, or at least another Asian country, discovered the New World first. But, despite all of the people he meets along the way, no one has heard of the monk nor does Geddes seem to find any additional evidence to prove that the Americas were first discovered on the western side of the continent past what has already been written about. Kingdom of Ten Thousand Things is an entertaining travel story, al beit dry and overly tangential in parts. I found myself losing focus when Geddes would run on talking about the history of a certain place or an unrelated story. But, as the book went on, I learned to read it more as a history book than a travel story, although it is easily both, which helped me keep track of his adventure. 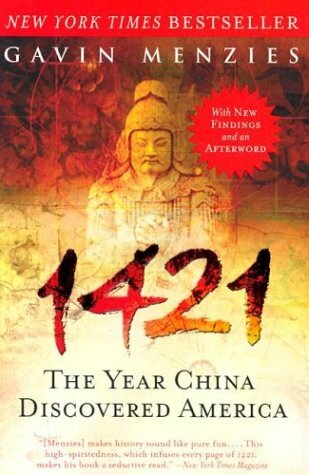 Thankfully, I had also read Gavin Menzies’ 1421: The Year China Discovered America previously, since that helped offer background perspective. My biggest issue with Geddes’ journey is the manner in which he did it, or at least my own expectations. I had anticipated Geddes would retrace the overland route from Kabul to Chiapas, as the subtitle says, and follow the same route that Huishen took, or at least the best path he could find from the limited information he had on the monk. But, instead, Geddes many times skipped the overland route in favor of flying. I felt this was cheating a bit, since Huishen did not have this option when he made the journey centuries ago. It’s probably best that Geddes did not do this, though, since he was abroad, in China actually, when the September 11th attacks occurred. If he were going overland, he probably would have been in Afghanistan at that time. Overall I liked the Kingdom of Ten Thousand Things. Like I said, it can be dry like a history book at times, but if those are the reader’s expectations going in, then the story will be more easily digested. So, as such, I recommend it to any lovers of history, particularly those of the camp that believe the Chinese were the first to discover the New World. It’s a great story that builds on those beliefs and the evidence that has been discovered pointing to that possibility.